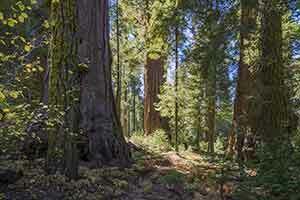 A few isolated redwoods are tucked into the dense understory along the Deer Creek Grove Trail. 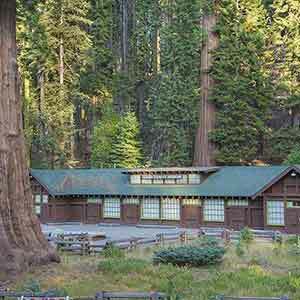 Deer Creek Grove is the southernmost grove of giant sequoias. 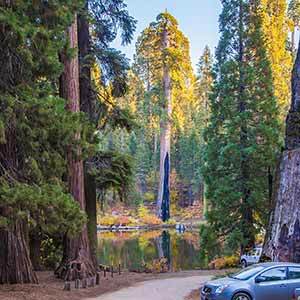 Reachable by a short but steep trail, the grove consists of a smattering of old-growth sequoias on a sheltered east-facing slope. 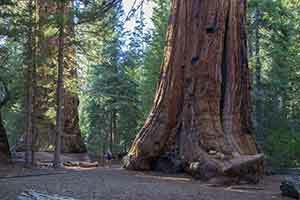 Although some of the trees are pretty good-sized, as a whole the grove isn’t anything special; it’s only about 200 yards long and only about a dozen big trees are visible, most of which are obscured by foliage. 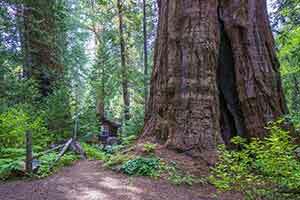 The hike is worthwhile if you’re interested in seeing the southernmost sequoias, but if you’re just interested in seeing some big trees there are more spectacular groves, such as the Trail of 100 Giants, nearby. 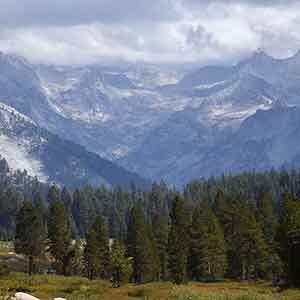 The grove is attractively situated about halfway up a pine-covered mountain that rises above a valley of grassy foothills. 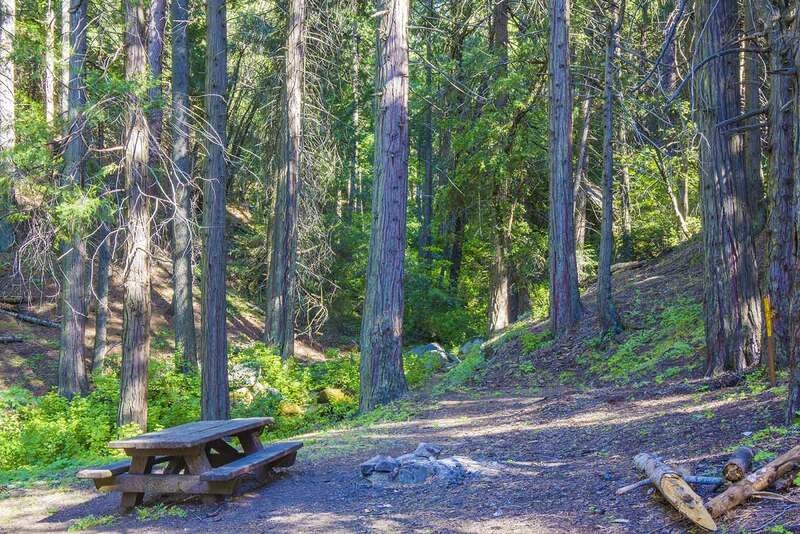 There doesn’t seem to be any poison oak in this area, even on the trails that lead downhill from the grove and into the oak grasslands, an elevation that would normally be infested with poison oak. This makes hiking in the area a lot more pleasant. The road to the grove is closed in the winter and spring, until as late as June 15th. 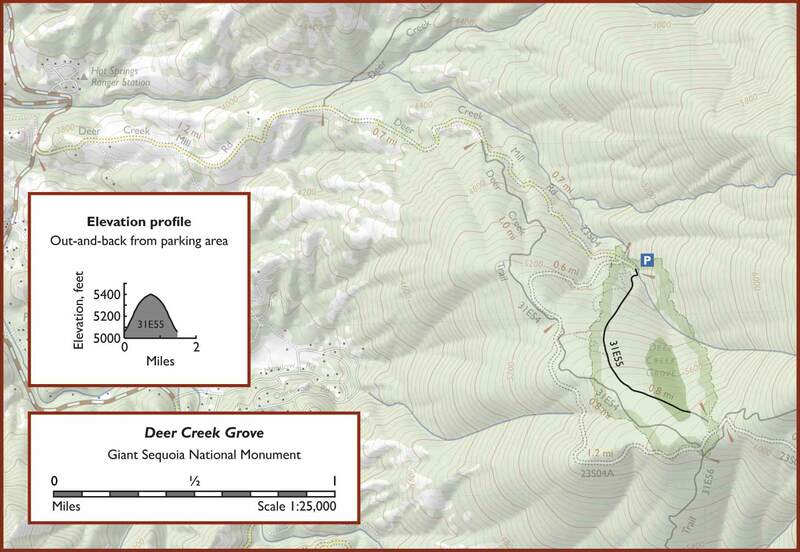 During this time the grove can still be accessed by hiking an enjoyable if somewhat mundane 5-mile loop, starting with a climb up the Deer Creek Trail, a well-maintained singletrack route that mostly seems to be used by local equestrians. 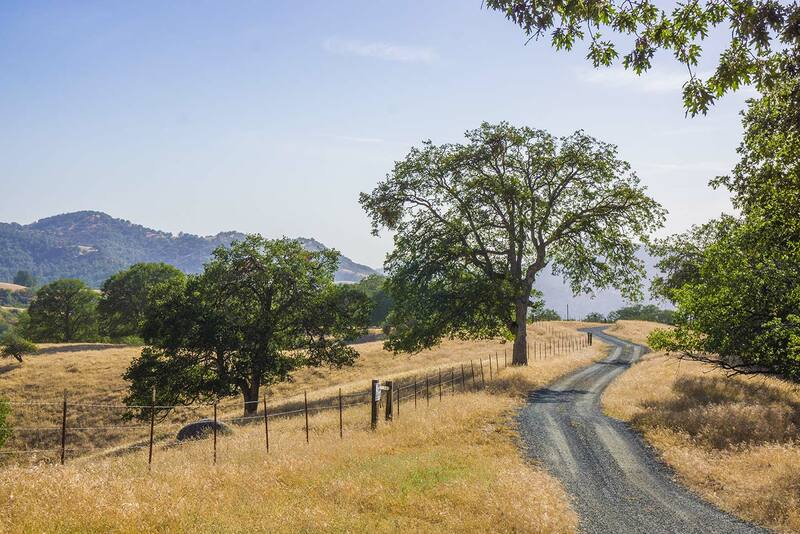 Deer Creek Mill Road starts in the retreat town of Pine Flat and climbs through golden oak-dotted foothills, passing some cow and horse ranches. Surprisingly, less than a mile from the trailhead the road is still running through low-elevation grasslands that look nothing at all like a sequoia grove. 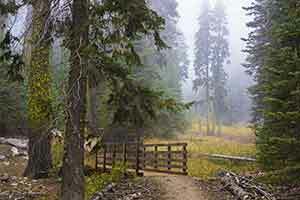 The gravel road finally enters a forest of small pine trees and climbs through a small ravine. It’s somewhat steep but in good condition; formerly in such poor condition that it was closed for several years, the road was upgraded in 2011 to make it drivable with regular cars and is now supposed to be mainintained annually. 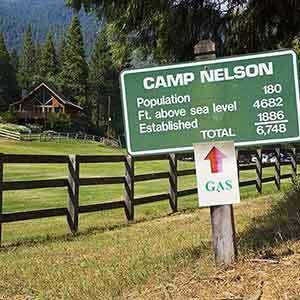 The road ends at a cul-de-sac with a picnic table or campsite, in an attractive wooded dell by a burbling creek. 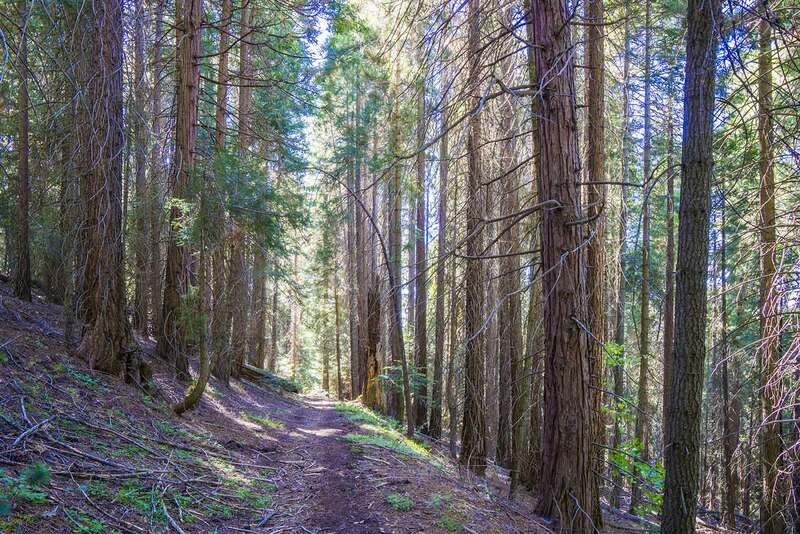 The unmarked trail starts from the picnic area and climbs steeply along the route of an old sunken jeep trail, almost immediately passing two good-sized sequoias. 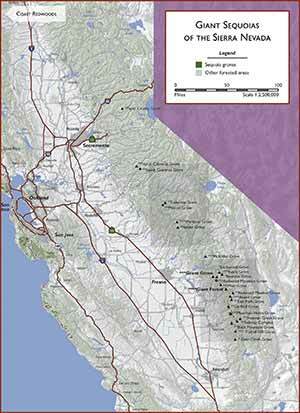 It then climbs steeply through a pleasant but unexceptional forest of very small pines with no sequoias. A faint track branches off at a deteriorating wooden sign that says "Deer Creek Mill Camp". This track, rather than the jeep trail, actually appears to be the official route from the cul-de-sac to this point. Although it’s actually much nicer because it’s not as steep, it’s very faint and unmaintained. After the intersection the main trail continues to climb, but at a more reasonable grade. 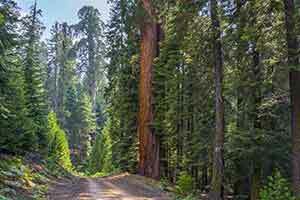 Finally, a few sequoias appear, all within a 200-yard stretch of trail. 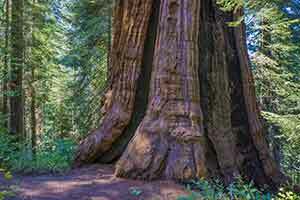 Some of the sequoias are pretty good-sized. 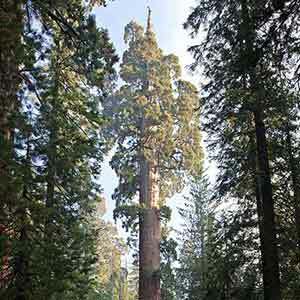 Six big trees grow near the trail and are clearly visible, while four more big sequoias can be glimpsed through the dense foliage, most notably a grizzled giant at the top of the grove. The forest of small pine trees seems to be a little denser in this area, but there isn’t a significant change in the look of the forest as there is when entering many other sequoia groves. 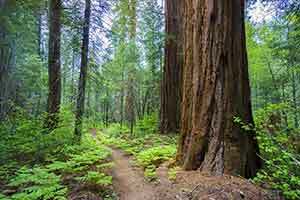 As the trail leaves the cluster of sequoias, the last tree on the right is the southernmost sequoia that’s visible from the trail. 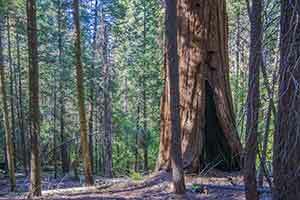 I haven’t explored off-trail so I don’t know if there are other sequoias hidden in the understory further south. Turn around at this point; the trail ends at an old dirt road a short distance ahead.